How Congress Quietly Overhauled Its Insider-Trading Law : It's All Politics With no fanfare, Congress moved to undo large parts of the popular law known as the STOCK Act, and President Obama has signed the watered-down measure into law. Insider trading is still illegal, but disclosures of large stock trades by staffers will be harder to get than under the original law. 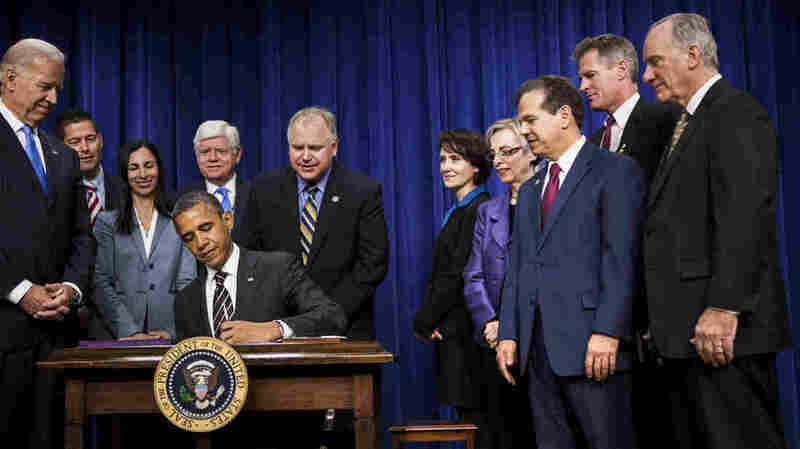 Vice President Biden and members of Congress watch as President Obama signs the STOCK Act on April 4, 2012. A year later, Congress moved to undo large portions of the law without fanfare. The legislative process on Capitol Hill is often slow and grinding. There are committee hearings, filibuster threats and hours of floor debate. But sometimes, when Congress really wants to get something done, it can move blindingly fast. That's what happened when Congress moved to undo large parts of a popular law known as the STOCK Act last week. A year ago, President Obama signed the Stop Trading on Congressional Knowledge Act into law at a celebratory ceremony attended by a bipartisan cast of lawmakers. "I want to thank all the members of Congress who came together and worked to get this done," he said. The law wouldn't just outlaw trading on nonpublic information by members of Congress, the executive branch and their staffs. It would greatly expand financial disclosures and make all of the data searchable so insider trading and conflicts of interest would be easier to detect. But on Monday, when the president signed a bill reversing big pieces of the law, the emailed announcement was one sentence long. There was no fanfare last week either, when the Senate and then the House passed the bill in largely empty chambers using a fast-track procedure known as unanimous consent. In the House, Majority Leader Eric Cantor, R-Va., shepherded the bill through. It was Friday afternoon at 12:52. Many members had already left for the weekend or were on their way out. The whole process took only 30 seconds. There was no debate. "There weren't too many members of Congress who were aware of this legislation," says Craig Holman, the government affairs lobbyist for Public Citizen. "And I suspect very, very few understood what a sweeping radical change it is to the STOCK Act." To understand how the law changed, I asked Holman to meet me in the basement of the Cannon House Office Building. "This is where the public records are kept, for those who can handle traveling to Washington, D.C.," Holman explained. That's right. If you want to look up the financial disclosure forms filed by high-level congressional staffers — say, to find out whether they've been using the privileges of their positions to make well-timed stock trades — you have to come to this office. Holman showed me how it works. You have to enter your name and address into a computer, and then you can search. But you have to know the name of the person you are searching for. If he or she has filed a financial disclosure form, it will come up as a PDF, which you can print at a cost of 10 cents a page. "The database itself is almost meaningless," says Holman. He says the only option for those who want to get a comprehensive look at what some 2,900 staffers have filed is to review the cases one by one. "And that's just too big a job for anybody to do." The STOCK Act was supposed to make this task significantly easier. Records for members of Congress, the executive branch and their staffs were supposed to be posted online in a searchable, sortable and downloadable format. If you wanted to see who traded health care stock just before a committee acted on a health care bill, it would be easy. No trips to the basement required. But there were concerns, especially among the 28,000 executive branch staff who would be required to post their financial disclosures online. "There were particular concerns about risks for those who either travel overseas on government business or work overseas," says Carol Bonosaro, president of the Senior Executives Association, who represents many of those executive branch employees. An independent study said there were also risks of identity theft, which she says the new law helps avoid. "What has been eliminated now is the ability of people to go phishing, if you will," she says. The White House cited the independent report in explaining why the president signed the bill. And a spokesman for Cantor said the House and Senate were simply following recommendations of the study. But Lisa Rosenberg, a lobbyist for the Sunlight Foundation, which advocated for the STOCK Act, says Congress went too far. "It's really shocking that they used basically the situation of questions about whether some language in the bill was overbroad to just gut the bill — to gut the transparency measures that apply to themselves," she says. Still, two major elements of the law remain. Insider trading is illegal, even for members of Congress and the executive branch. And for those who are covered by the now-narrower law, disclosures of large stock trades are required within 45 days. It will just be harder to get to them.